Being a blogger is a fun & unique experience. One great thing about blogging is the sense of community you get to create & participate in. You read other blogs. You interact with people. You follow them on social media. Leaving comments is a fantastic way to be engaged with readers as well as other bloggers. You stimulate conversation. You acknowledge other blogs. As a social media manager, I've seen some wonderful, thoughtful comments & I've seen some pretty abysmal stuff too. 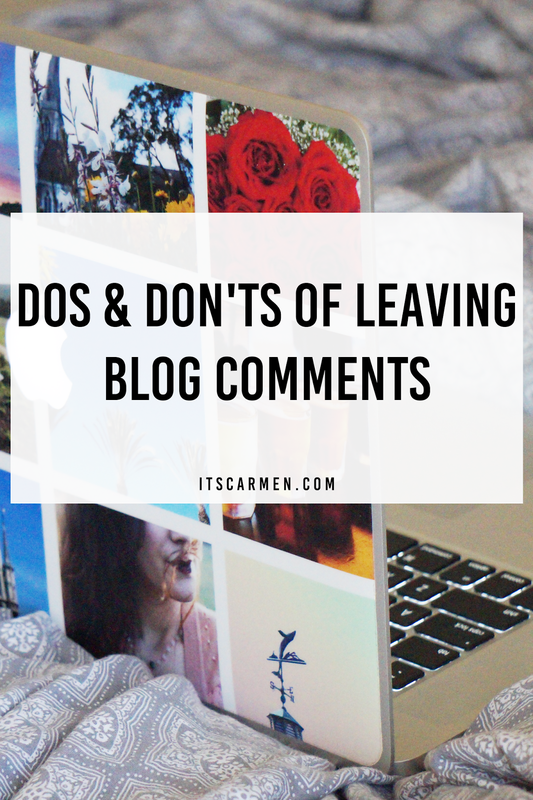 Read these do's & don'ts of leaving blog comments & let me know if you agree. This is rule #1. This is vital. This is necessary. If you didn't even read the post, do not comment on it. There's just no point, because your comment adds nothing of value. You are simply judging the post based on a title or photo. You can really tell when someone didn't read the post because their comments come out really generic. "Really nice" is not a good comment. Read the post. Read the post. Read the post! Be yourself. No need to create some persona. If you don't like their shoes, don't comment that you love their shoes. You can comment about something you do like. "Wow. I really love your nail polish color. Light pink is perfect for summer." or "I'm normally not the biggest fan of Birkenstocks but you rock them!" Don't be afraid to be you. Sometimes you may have a question on something within the blog post. Don't be afraid to ask. In fact, this helps to stimulate an interaction. Ask the writer about how the product worked or how they liked the music festival they just attended. This creates a dialogue & shows you're not out to just promote yourself. I love it when people chip in with their own experience. If I write about a certain movie, I like when someone comments that they loved it, hated it, thought it was funny. Sharing an example also shows that you actually read the post. You are expressing a little bit of your personality or experience. For example, one blogger was going to visit Paris. I recommended that if she needed an ice cream break she should visit Berthillon because it's the best ice cream I ever had. I shared a personal experience & thought which adds value versus just saying "Have fun." If your comment reads "Very cool," but your self-promotion reads "How about you check out my blog? | BlogName | Giveaway --> here | Facebook |," I will just delete your comment. You obviously don't care at all about what I wrote, you just want to promote all of your accounts. Please do not do excessive self-linking. No thank you. One time I got 3 "great post"s in a row. That's all they said besides promoting their own link. Your best bet is to point out something specific from the post. Did you mention that their dog, Willow, was really cute? Good job, you caught their pup's name. Did you comment that you too hate Sundays? Great point, you pointed out that you have something in common. Don't be generic, it's not cool. We are humans. We don't always agree or believe the same thing. It's perfectly okay to be honest. If you had a weird experience with the mascara the blogger says she loved, that's totally fine to voice in your comment. It's fine to respectfully disagree. That's what makes it so fun. We all have different experiences. But make sure you're not being a negative Nancy. Please don't copy & paste the same message to every single person. It just lowers your credibility. It's kind of like the boy who cried wolf. If you comment "You look lovely in this outfit." to 50 bloggers a day, someone is bound to notice & not take you seriously. Be different. Be unique. Find something in particular you can focus your comment on. P.S. Am just kiddin about the spam comment , it's very honest , am sick of spam bloggers all over the place , they just wanna have a 1000 followers per month & they think it's their only way for doing this !! why not impress people with my blog so they genuinely follow you ? i get these spam comments alot & it stresses me out because i has so much effort into my post & i get no attention or caring !! very good points. I have had people constantly leave generic comments on my blog. So generic that sometimes the comments are not even relevant to what is my post ! So I appreciate genuine comments. Yeah, it's easy to tell if someone just wants you to click their link! I totally agree with your dos and don'ts. It is very obvious when people haven't read your post! Its so nice to get a genuine comment. Great idea for a post! I so agree with everything you wrote. I often see a few identical comments written by the same person on one post (happened to me more than once) and I find it completely ridiculous. I just wanna scream "keep your spam outta my blog!!" Haha. such great points! those completely copy and pasted 'just stumbled on your blog and i love all the photos, wanna follow me on 50 different platforms and i'll probably never comment on your blog again' comments really irritate me! Thanks for this post! as a new blogger, this is definitely helpful and i'll have to keep these in mind! :) also, i really really love your blog layout! I do question the success rate of the generic comments (who encourages this behaviour?) as I never visit their blog - but ALWAYS visit and read blogs who put actual comment genuine thoughts. I think genuine, respectful and engaged is the only way to go! I love that you wrote this. 'Great post' is the worst because their link is longer than their comment! >.< I agree genuine, respectful, & engaged is ideal! I hope I could get many comments on my blog post like you have! 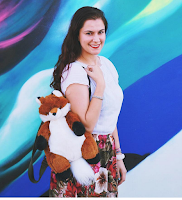 Haha I completely agree with you on this post-- this is a topic that gives myself and a fellow blogger much angst as we groan and moan over how so many bloggers leave insanely long self-promoting taglines on our posts or just write one or two generic words like "great post" or "great outfit". I usually am way too nice and try to comment back on their blog with something thoughtful, but if they really don't respond back in the future with anything worth reading, I just kinda give up on them :P I definitely like your idea of leaving questions on comment section as it does engage the blogger and encourage a small discussion. To answer your question on my last post, yes there were indeed pineapples on my shorts! For you, I ask: what is your favourite type of post to write (as I've noticed that you have an enviable wide range of topics that you like to write about)? Everyone who comments on blogs should read this post and live by it! I usually go by the rule: If I don't have anything (nice) to say, I won't say anything at all! totally agree with you. In the sea of comments like check my blog and your photos are great (ahhaha!) a genuine comment is lost somewhere. Hahahaha...this is a very interesting post, but true though! I believe we're all guilty of this at some point in our blog stages. People just don't wanna admit to it. Great post Carmen! You make some very good points in your post. I just wish more people actually took the opportunity to make comments about my posts (hmm, maybe I should be careful what I wish for), because I don't get a lot of comments. Perhaps that's because there just are not a lot of readers of my blog...ok, now it's becoming painful to comment. I like this article a lot. I think the hardest thing to do is to write an original comment on an outfit post with an outfit you really like. These comments never get answered and don't even seem original even if I sincerely say "you look great!". And also, you have a very nice blog! I just took a quick look and liked 3 articles just off the top! Very fun and interesting reads! Hear Hear! I once got a comment saying "oh Ashley, you look great". My name is Bec.. *gulp* awkward (unless it was an accident and now I'm being the assuming one). I have recieved the 'nice post' - www.pleaselookatmyblogpleaseplease.com ones too and although I accept them they add no value and I don't bother checking out their blogs. I like how you put your opinion out there girl! I also agree with everything you are saying. Great POST! I completely agree! Commenting is a great way to connect but some people just spam or just try to pub themselves not caring about the contents of the blog! I'm so happy that someone finally sad it, because I think that people tend to forget that everyone works hard on their blog and everyone would like to get somewhat noticed by others, but spamming isn't the way to do it. I think its find to leave a link in the bottom of a comment that actually belongs there, because if people like your comment/style/point, then they will click on it due to genuine curiosity. I tend to only check out the blogs that comment in that style anyway. Plus isn't interaction the point of blogging? These are such great tips that you have provided but sometimes, When you are commenting on fifty different blog pages at once, it's pretty hard to stay genuine for all fifty of them cause you don't have the time to really craft up fifty different authentic comments to each of them without eventually repeating yourself to some of them. Yes I know that this is a bad practice to be following but really and truly, If you can't come up with a good and genuine comment to all of them, then perhaps you should probably just stick to like 10 blogs a day or even every 6 hours or so. I am guilty of breaking some of these rules but sometimes, I just want to get it over and done with. Not everyone has the time to make a long comment to make it seem genuine, sometimes short comments like "Nice shirt, I really love the pattern on it!" can still be genuine too and not just seem like a sad attempt of getting people to come visit your blog. Amen to that! I actually quit blogging for a while because I felt like the spam commenting situation was getting so bad. Everywhere you go, you just see this generic comments with links to other blogs. If someone posts an interesting comment, I don't think that a link to their blog is even needed. I will follow the link in their name and check out their blog because they legitimately seem like an interesting person. Just saying "great post!" doesn't do you any favors! Worst Comment I have ever received: "Wow, your post about this gadget is really cool. Wanna check more gadgets on our site? [URL]"
What's even worse: That post was not about gadgets. It's about facial wash. LOL. I just hopped over to this post from your spam post. As a new blogger, these are such great things to keep in mind. I've been reading blogs for years without commenting, but now I make an effort to so that I can be part of the community. I never comment just for the sake of commenting or promotion, but I'm definitely going to be more conscious about how generic or genuine I'm coming off. The next time I'm tempted to write a quick "Great post! ", I'll know not to. Thanks for sharing! Couldn't agree more with this, I think if you're not going to leave a genuine comment then don't leave anything at all! Huge plugs or purely self promoting blog comments can be a pain but I think one of the funniest things that happened to me was when someone commented on one of my outfit photos saying "love the skirt" ....and I was wearing shorts.